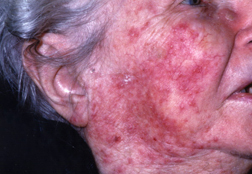 Rosacea (rose-ay-shah) is a common, long-lasting skin condition that causes inflammation and redness of the face. It usually starts with redness on the cheeks and nose, and also can affect the forehead and chin. The late comedian W.C. Fields, who was known for his wicked wit and red, bulbous nose, had an advanced case of rosacea. Rosacea tends to affect fair-skinned adults between ages 30 and 50 who have "peaches and cream" complexions and a history of blushing easily. Women develop rosacea more often than men, but men are more apt to develop lumpy, enlarged noses, a condition called rhinophyma. Rosacea often is mistaken for sunburn and often goes undiagnosed. It is a very treatable condition.